The Access Plans page shows the various access plans that are on the system. 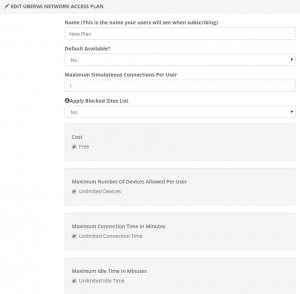 Access plans are used to control access to the network, and can be configured to have different options, such as costs, speed, duration, and number of devices allowed. Plans can be available on every profile or may only be available on specific profiles. Name: The name for the access plan. If there is more than one access plan available then this name will be shown for the user to pick from. Default Available: Choose whether this option will be available on all profiles. If set to no then each profile that uses this plan must have the plan explicitly checked on the Access Plans tab of the Profile page. Maximum Simultaneous Connections Per User: The maximum number of simultaneous connections that each user will be allowed to have at one time. If they go over this limit then previous connections are disconnected. Apply Blocked Sites List: Controls whether or not users on this plan will be restricted from accessing web sites on the blocked sites list. Cost: By default plans are free. 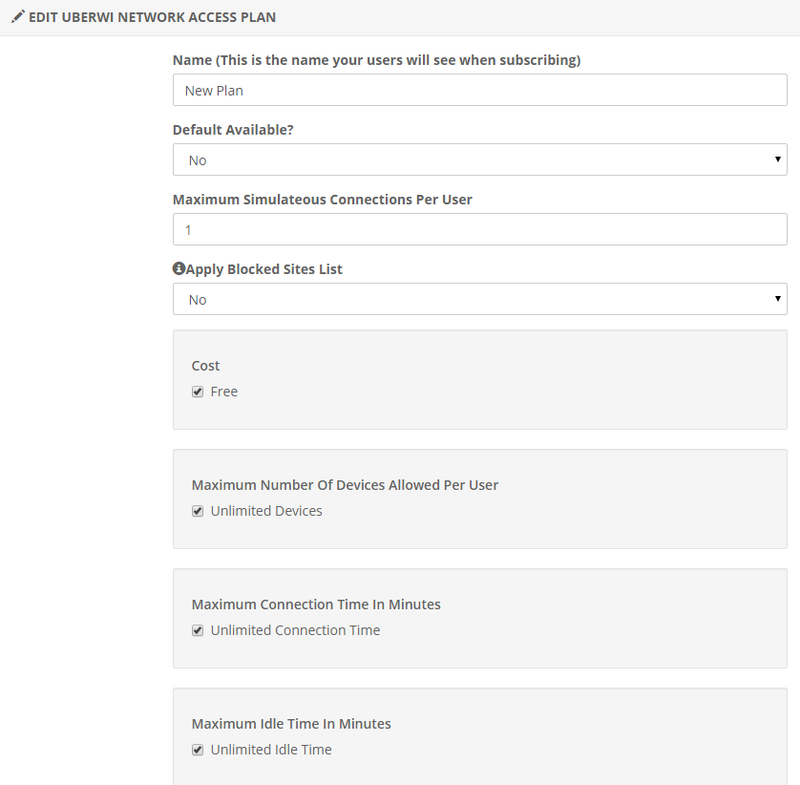 Use this setting to adjust the desired cost of the access plan. Maximum Number of Devices Allowed Per User: The total number of devices that any account can use. Additional devices over this limit will be refused. Maximum Connection Time in Minutes: The time for each connection session. Maximum Idle Time in Minutes: If a device is idle for this long it will be disconnected. How long is plan valid for: Controls how long the plan is valid for, such as for one month or one year. Bandwidth Allowed: Different sliders control how much bandwidth is allowed up and down. The burst values should be set greater than the corresponding up or down values. Permitted Access Times: Controls the times that users on this plan are allowed to access the network.